Experiencing good days with good friends for more than 15 years! The Community Opportunities Club supports adults who have been impacted by a physical disability or brain injury to regain the confidence and independence needed to lead more productive and active lives. 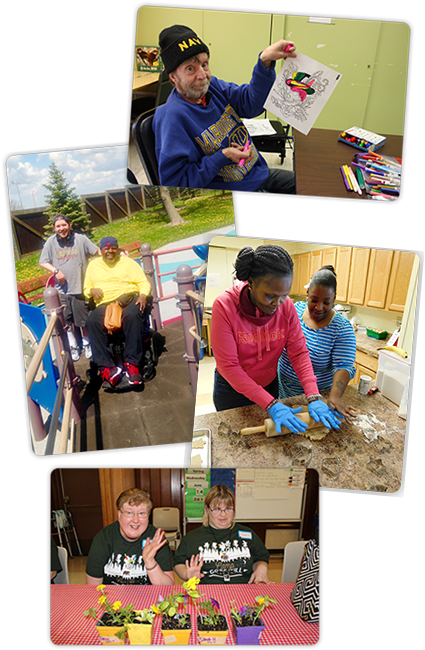 Goodwill operates three drop-in centers that develop and provide activities based on individual interests and needs. Our participants may choose a variety of opportunities to improve life skills through vocational referrals, health and wellness activities, arts and enrichment classes, community integration and volunteer opportunities. The result of this selection of structured and self-directed activities is enriched lives and lifelong friendships with others who understand their situation. Our unique approach to empowerment allows peer groups the opportunity to pursue their own endeavors, providing valuable social-skill development. What is gained is something wonderful — a renewed sense of self-worth, community reintegration, and the highest possible level of independence. Recreation and social activities such as playing cards, enjoying sports or exercise, arts and music appreciation, parties, using computers, and spending time with friends. Community integration such as volunteer opportunities and career exploration. Supportive learning environment with opportunities to build new skills while maintaining present abilities in communication, academics, self advocacy and independent living. Personal attention to your needs and desired outcomes. Trained staff dedicated to providing you good days with good friends! Have a physical disability or brain injury. Have an interest in recreational/social activities and increased community opportunities with a desire to remain as independent as possible. Do not require any skilled nursing observation or care. Need minimal to no assistance with daily living skills. Do not pose a safety risk to self or others. While hours of operation vary slightly by location and services, most Day Service programs operate Monday through Friday between the hours of 8:00 AM-4:00 PM.